On the California celebrity gossip scale, Apollo 11 moonwalker Buzz Aldrin's breakup with his wife of 23 years, Lois Driggs Cannon Aldrin, may not rate as high as the troubles of Hugh Hefner or Arnold Schwarzenegger. 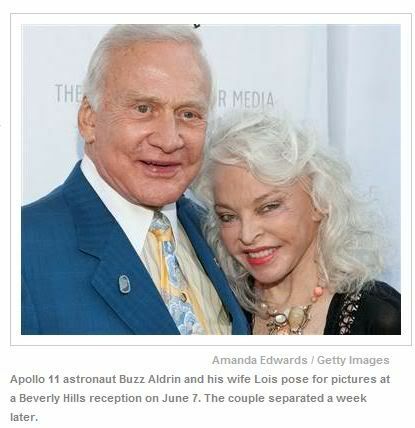 But Aldrin is one of the best-known celebrities of spaceflight, and he did make a splash on "Dancing With the Stars" last year — so the fact that his lawyer filed a petition for marriage dissolution in Los Angeles Superior Court on Wednesday is notable. Lois Cannon is Aldrin's third wife, and in better times the astronaut credited her with helping him through his struggle with alcoholism and depression. In Aldrin's 2009 autobiography, "Magnificent Desolation," he wrote that "every Superman needs his Lois." Her daughter, Lisa Cannon, has helped manage Aldrin's business affairs. The divorce petition, which first came to light on the TMZ gossip website, cites "irreconcilable differences" as the reason for the split. The 81-year-old Aldrin became famous as an astronaut in the Gemini and Apollo programs, and most notably as one of the first men to land on the moon along with Apollo 11 commander Neil Armstrong in 1969. Since then, he's remained in the public eye through his efforts to promote commercial spaceflight, including contests for the general public. This March, he teamed up with another celebrity with a Ph.D., British physicist Stephen Hawking, to announce a new effort to "better mankind's future in space." He also keeps up with TV appearances, most recently on "30 Rock" and "WWE Raw Live." On the personal side, Aldrin has three children by his first wife, Joan Archer: James, Janice and Andrew. His second wife was Beverly Zile (1975-78). Aldrin's no stranger to the gossip pages: In the past, he's made the headlines for punching out a moon-hoax gadfly, expressing admiration for lovelorn astronaut Lisa Nowak, acknowledging that he's had a facelift and suing a trading-card company. I suspect he'll get through this latest tabloid episode as well.